My son, Chase, is wearing the costume. 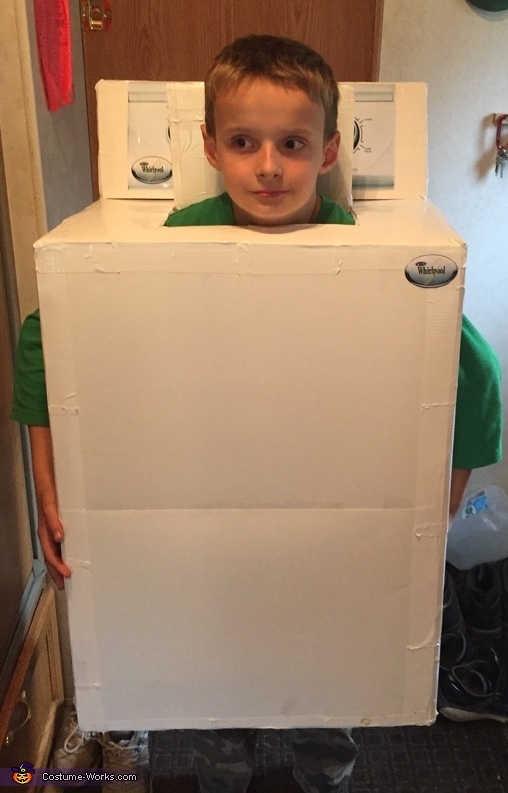 He wanted to be a refrigerator box, but I knew that was impractical. He wanted to be just the box not a refrigerator. I thought I could come up with something better to do with a box. The washer was made from a styrofoam cup box, white poster board, white duct tape, graphics printed from online images, scotch tape, electrical cord, clear packing tape to protect graphics from rain or mishaps and wire ties and nuts. I used two of the flaps that were cut off to make the control panel by adhering them together with heavy double stick tape. My husband, Bob, added the electrical cord. Chase's sister, Sam, printed a serial number graphic from the Internet.